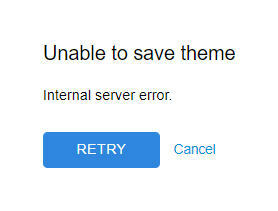 Unable to same the theme / internal server error!! What's and where's the problem? It happens on all sites! Today I get the error above after enter the login and want to save in editing my template! While editing the error occurs too After a while of 'saving ...' What's and where's the problem? It happens on all sites! I'm also getting the same problem! Hi, I'm also getting the same problem! Could you please try now. Does the issue continue? But, I'm afraid if the company goes under one day ... We are not longer able to work and edit our templates as opposed to working with local software! Hi, it works again. But, I'm afraid if the company goes under one day ... We are not longer able to work and edit our templates as opposed to working with local software! But we're not going to close this project in the near or not so near future.